To say that NYC is a magical place during the holiday season would be an understatement. Folks flock from all over the earth to visit during this festive time. And while the tourists are pounding the pavement in Manhattan, grab the family and head on up to the Bronx for a true holiday treat. 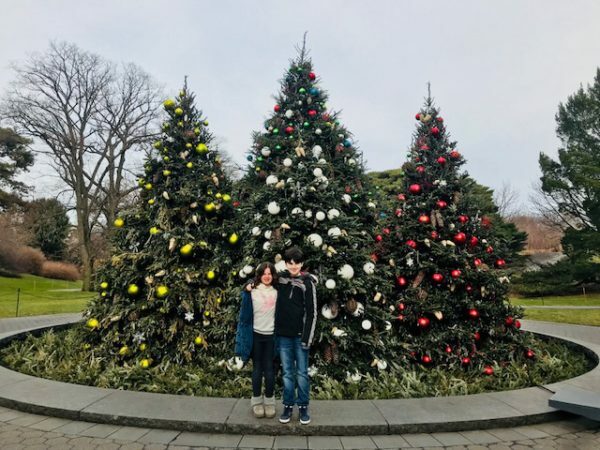 Especially if you're feeling a little humdrum now that the holidays are coming to an end, you can still get a dose of holiday magic and inspiration at the New York Botanical Garden Holiday Train Show, running through January 15. My family and I have wanted to attend for the last few years but it always seemed to escape us...between the hustle and bustle of the season, and the needs of the kids, we just never made it. Until this year. We headed out on the hour long drive the day after Christmas. The drive is less than stellar but, you get to see some of the old draw bridges in the borough, along with Yankee Stadium, if you are so inclined. It's a great introduction to what is in store at the train show, actually, as you go back in time and witness what the five boroughs were like 100 years ago! There's parking right across the street from the Botanical Garden and we were immediately captivated by the giant wreaths on the entryway gates. Holiday music played as we strolled along the pine trees of all shapes, sizes and type. As you enter the magical white tent of holiday and train awesomeness, you are greeted by a conductor, complete with golden trains on his shoes and shoulders. He stops and gives a double thumbs up for everyone who passes by to take a photo. Like a locomotive Santa of sorts! Right past the conductor is the first giant model: a replica of the original Macy's. And it was beautiful. Next up was a mock train boxcar where a short video is shown about the history of the train show and the artists and model makers who create it all. While it can be tough for the little ones to get through, it is worth it (and the way into the exhibit) to see the faces and hear the names of the artists who have created this miniature world for us to pass through. The exhibit starts off with bridges and buildings and lots and lots of festive decorations and, of course, TRAINS! You think that it is beautiful and amazing and that would be enough but then, THEN you head down a hall into another space and THAT is where the magic really lies. Landmarks from each borough, from the turn of the century to date are there to behold. Visit Brooklyn and see the giant Cyclone roller coaster and Brooklyn Bridge, or Yankee Stadium in the Bronx. Head to Manhattan and see Radio City Music Hall, the George Washington Bridge, Grand Central Station, the Apollo, the original Penn Station, the Arc at Washington Square Park and so much more. All of the models, bridges and structures in the exhibit are made of wood and bark. The details are exquisite. As we traveled through, we kept thinking, "How did they make that?" or "Wow! Look at the detail on THAT!". To say it is awesome is not giving the many men and women who create and maintain the event the credit they are due. Everyone is snapping pictures of it all, so be prepared to stop a lot as you move along. It is not just a beautiful exhibition, but one of deep historical value as you walk past models of The Jewish Museum, Tammany Hall and a lighthouse that once sat under the GW Bridge, to name a very few. All from a bygone era our children know very little about but a fantastic way to introduce them to all the history that is right in their backyard! Enchanting model trains zip through a display of 150 landmarks, each re-created with bark, leaves, and other natural materials—all under the twinkling glow of the Enid A. Haupt Conservatory. Marvel at G-scale locomotives humming along among familiar sights such as the Brooklyn Bridge, Statue of Liberty, and Rockefeller Center on nearly a half-mile of track. This year’s exhibition showcases Midtown Manhattan, with iconic skyscrapers and other architectural wonders sharing the spotlight among old and new collection favorites that define this celebrated district. And we at A Madison Mom are so happy to share this very special offer! *Valid only when you use code 9426 online at nybg.org. Valid for All-Garden Pass visits made from November 22, 2017–January 15, 2018. Not valid weekends from November 22–January 15 or December 18–January 1, 2018. Offer subject to availability. Orders are limited to 6 tickets. Not valid on Special Event tickets or group tours. Discount cannot be combined with any other promotional offer or previously purchased tickets. Discount may be modified or withdrawn without prior notice. Tickets are not refundable or exchangeable. 5 Favorite Things In and Around Madison, NJ: NYE Weekend!